David Granger’s administration has a schizophrenic position on reparations #guyana – mark jacobs lives! Chairman of the Guyana Reparations Committee, Eric Phillips told Demerara Waves Online News that five of the 25 books, which will “correct our history,” will be handed over to [attoeney general basil] Williams next week. “It’s background for him to get the resolution passed in Parliament but is also our legal case against all States whether it is the Guyana State, the British State or the Dutch State- all three are responsible,” he said. He supports the Caribbean’s “irreversible stand” for reparative justice because States have a legal right to address widespread systematic human rights violations such as the decimation of Indigenous Peoples and other races as well as the expropriation of wealth and property and the legacy of under-development across the region. 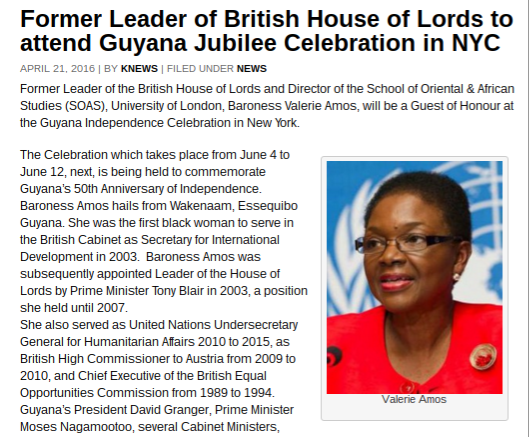 but if you take a closer look at the image above you’ll see that david granger will also be in new york sitting at the head table with the baroness. somebody talk to granger cause once again the yes negroes around and about him got him looking foolish.